Teatourist has provided me with the Crushes & Blushes Collection for the purposes of providing an honest review. I was super excited to receive the Crushes & Blushes Collection from Teatourist. Part of this box also included the announcement that they’re launching the Build-A-Box option on their website. It’s super neat for those who want to choose their own teas instead of getting one of the curated collections. You get to pick any six teas from Teatourist’s extensive catalogue of teas, and then they’ll package it all together and send it to you. No word yet on how much this will cost. I personally love getting the curated boxes, because a lot of the teas I get are ones that I probably wouldn’t pick for myself, but love getting the opportunity to try. 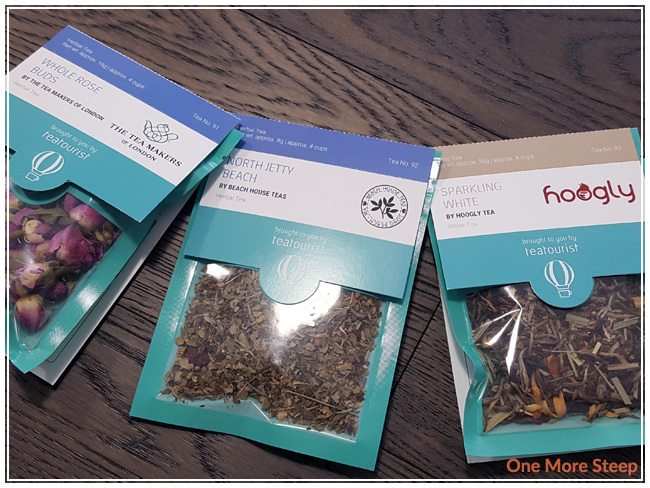 So if you’re into surprises, the subscription box might be a great choice for you – but if you want to choose your own due to allergies or just personal preference, that’s an option! 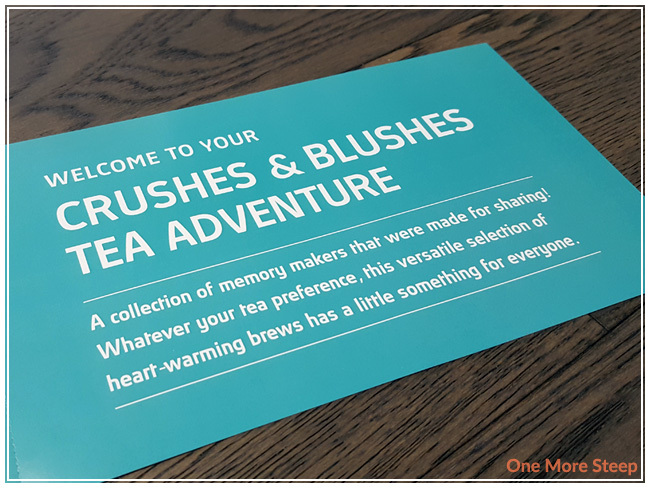 You could even gift a Build-A-Box to someone and put all that though and effort into a personalized tea box. Now onto the Crushes & Blushes Collection! 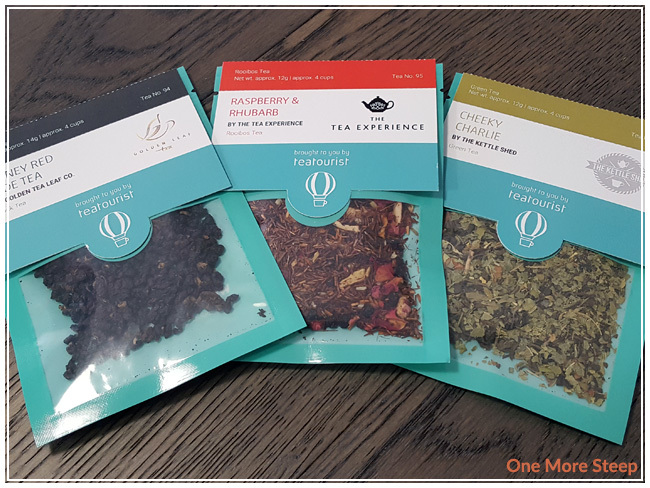 This box has a selection of six tea tasters: two herbal infusions, one white tea, one black tea, one rooibos, and one green tea. I’ll be sharing my thoughts on all six of them: Whole Rose Buds from The Tea Makers of London (herbal infusion), North Jetty Beach by Beach House Teas (herbal infusion), Sparkling White by Hoogly Tea (white tea), Honey Red Jade Tea by Golden Tea Leaf (black tea), Raspberry & Rhubarb by The Tea Experience (rooibos), and Cheeky Charlie by The Kettle Shed (green tea). From left to right: Whole Rose Buds, North Jetty Beach, and Sparkling White. Whole Rose Buds honestly reminds me of smelling a bouquet of roses! This herbal infusion consists of “100% whole rose buds”. These rose buds are super pretty and have a lovely pink colour to them. North Jetty Beach has a very pleasant aroma of mint and lavender. This blend consists of blackberry leaf, peppermint, basil, lemon verbena, lavender, rose hips, bee pollen, peaches, and pure extracts. I’ve never tried a tea blend with bee pollen before, so I’m really intrigued about it. Sparkling White has a very ‘crisp’ smell – if you’ve ever smelled a nice silver needle, you might know what I’m talking about, it also has a sweet aroma of apple and hibiscus. This white tea consists of Chinese white tea, Chinese green tea, lemongrass, orange blossom, apple pieces, elderflower, hibiscus, rosehip, orange peel, and natural flavouring. 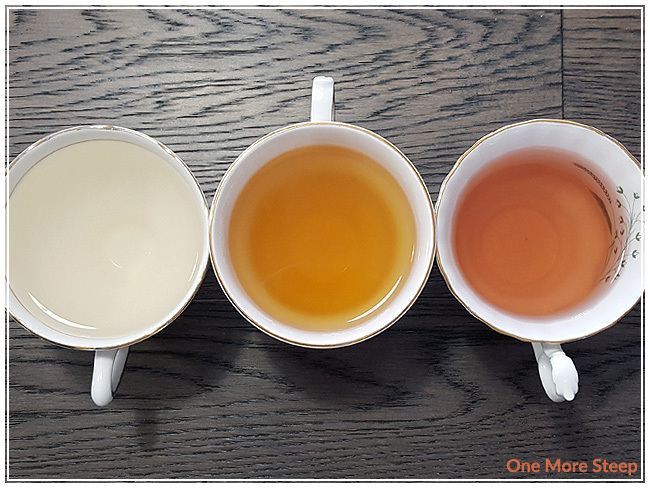 From left to right: Honey Red Jade Tea, Raspberry & Rhubarb, and Cheeky Charlie. Honey Red Jade Tea is a 100% black tea, it has a very subtle aroma to the dry leaf – it smells a bit sweet, but other than that I don’t get a lot of smell from the leaf. Raspberry & Rhubarb honestly smells exactly like it’s namesake, I don’t even smell the rooibos base and normally I can pick it out! 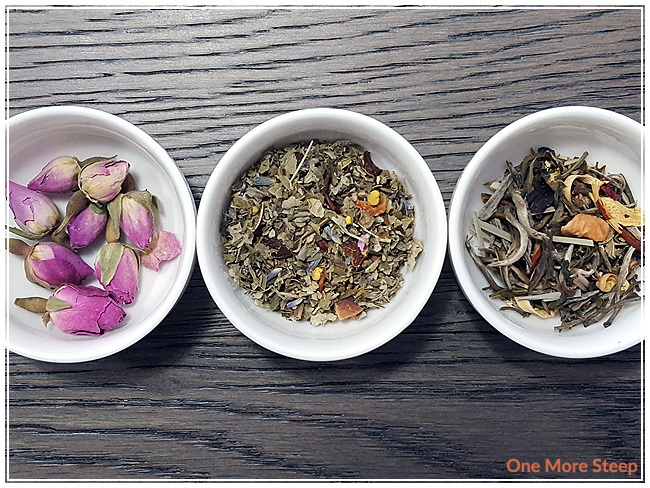 This blend consists of rooibos, elderberries, raspberry & rhubarb pieces, rose petals, coconut peel, and flavouring. Last, but not least, is Cheeky Charlie – this green tea blend has an interesting fragrance combination of lime and apple, and a little something in it that reminds me of smoke, like in a lapsang souchong. Cheeky Charlie consists of Chinese green tea, lemon verbena, calendula, apple pieces, lime leaves, sunflower petals, and flavouring. The Tea Makers of London recommends steeping Whole Rose Buds in 80°C (176°F) water for 3 minutes. I followed the steeping instructions. Beach House Teas recommends steeping North Jetty Beach in 100°C (212°F) water for 10 to 12 minutes. I steeped this herbal tisane for 10 minutes. Hoogly Tea recommends steeping Sparkling White in 80°C (176°F) water for 5 minutes. I followed the steeping instructions. Golden Tea Leaf recommends steeping Honey Red Jade Tea in 100°C (212°F) water for 3+ minutes. I steeped for 3 minutes. The Tea Experience recommends steeping Raspberry & Rhubarb in 100°C (212°F) water for 8 to 10 minutes. I steeped this rooibos blend for 10 minutes. The Kettle Shed recommends steeping Cheeky Charlie in 80°C (176°F) water for 3 minutes. I followed the steeping instructions. Whole Rose Buds steeps to a beautiful light golden yellow. It has a very floral aroma, and the infusion is pleasantly sweet with a much lighter rose flavour than I expected from the aroma. Luckily the rose flavour isn’t so much that I feel like I’m drinking perfume. It’s quite pleasant to sip and makes me feel like I should be wearing a dress while I drink this, it makes me feel pretty. North Jetty Beach steeps to a nice bright sunshine orange. 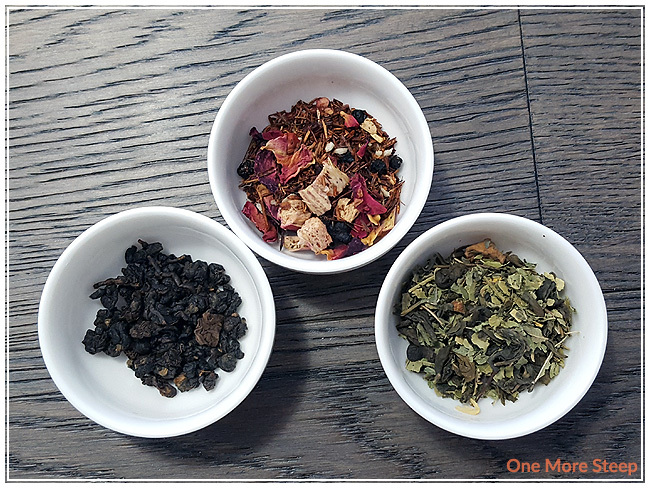 This steeped tisane has a very minty aroma and very little other ingredients make their fragrances known – there’s a hint of basil but I can’t taste it. I can taste the mint, lavender, and a really nice sweetness that I’m going to attribute to the bee pollen. The sweetness from the bee pollen is quite enjoyable, I think I’m going to have to source out some local bee pollen this year to add to my tea now that I know that it tastes good (to help with my seasonal allergies). Sparkling White steeps to this lovely red that leans towards a reddish-brown colour with a nice sweet apple aroma. I found the taste of this white-green tea blend to be sweet, I noticed there to be a nice balance between the sweetness of the apple and crisp floral notes from the tea itself, with just a hint of lemongrass. Honey Red Jade Tea steeps to a lovely orange and has a subtle honey aroma from the steeped tea. There’s a mix of earthiness and honey sweetness to this black tea, and just a touch of astringency – but it isn’t off-putting. I enjoy the honey notes in this one. Raspberry & Rhubarb smells like its name after it steeps to a dark reddish brown. There’s some oil that I spotted on the surface of the tea, I’m not sure if that is from the coconut peel or from the flavourings used in this rooibos blend. I found that this has a sweet raspberry taste with some tartness from the rhubarb. I did notice that Raspberry & Rhubarb has a slight medicinal flavour to it from the rooibos base, but it’s mostly covered up thanks to the other ingredients. Cheeky Charlie steeps to a bright yellow, it has a lovely apple and lime around. While this green tea blend has a nice sweetness to it, I also did note some astringency – I think it could be steeped for less than 3 minutes (perhaps start your initial steep at 2 minutes if you’re not a fan of astringent green teas). The flavours are nice and bright with the citrus ingredients, and the apple adds a nice sweetness to it. 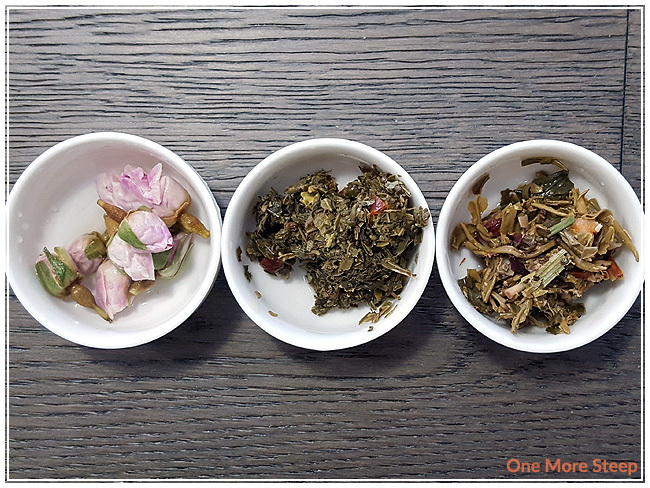 I resteeped Whole Rose Buds twice, and found that the first resteep was very similar to the initial steep while the second resteep was quite dilute (and not enjoyable). North Jetty Beach had mostly mint in the resteep that I did, the lavender was more absent on the second try with the same leaves. I resteeped Sparkling White twice and found that the flavours deepened in the first resteep and began to wane for the second resteep. Of the first half of the collection, I would say that Whole Rose Buds and Sparkling White did the best with resteeping. 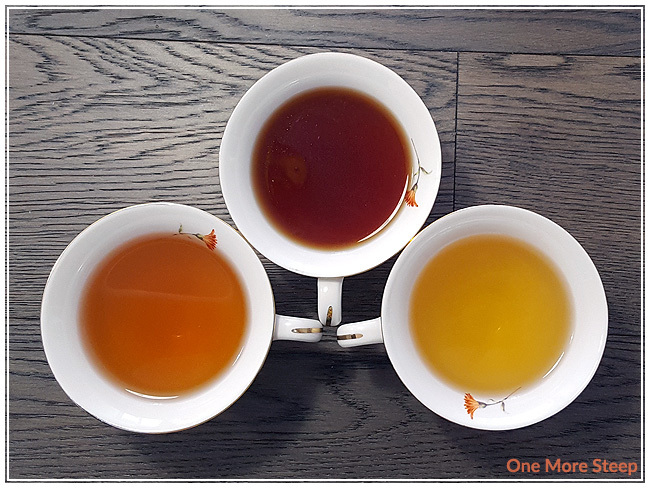 I resteeped Honey Red Jade Tea four times, and found that the flavours stayed pretty consistent throughout. Raspberry & Rhubarb was mostly just rooibos in my cup after resteeping, so I didn’t really like it too much (just not a strong rooibos fan, unfortunately!). I resteeped Cheeky Charlie twice, I found the lime flavour took a step back and the apple was more prevalent, which didn’t put me off since I enjoy apple in my green tea. I loved Teatourist’s Crushes & Blushes Collection. I like to try new things, so having a rooibos in there along with some tisanes and tea blends was great. Even though I’m not a rooibos fan, I really enjoyed the first steep of Raspberry & Rhubarb, I think that flavour combination would be great iced. 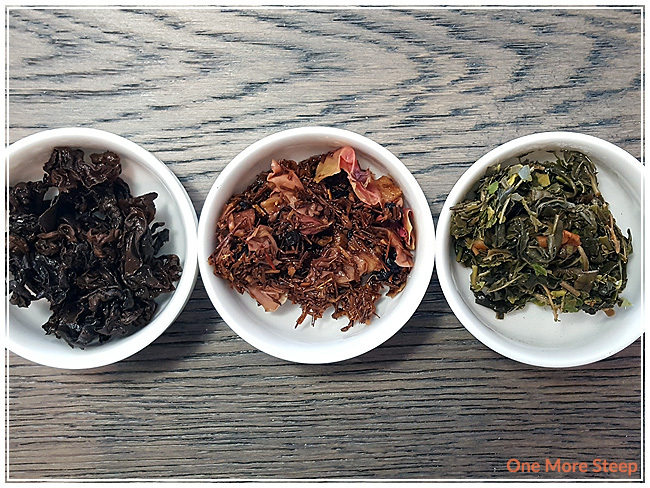 The resteep winner in the box was Honey Red Jade Tea, I loved how consistent the flavour stayed. But the one that made me feel like Teatourist really crushed it with this curated collection was Whole Rose Buds. There’s just something about drinking a sweet floral tisane that makes me feel pretty.